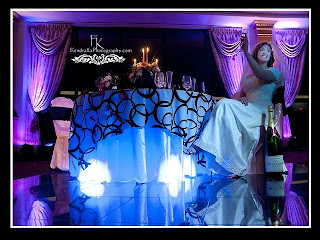 In this image, I used the drapes behind the bride to frame her and the lights and reflections to create a fun looking image. Spot metering and manual exposure was used again to create this image. If you like to play with photography, please learn this one tip, take your camera off "A" - auto or "P". When you leave your camera in either A or P, your camera is doing all the thinking. It is a computer and not an artist. I doubt that Thomas Kinkade leaves his brushes on auto. 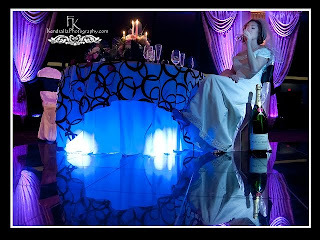 Lighting on the bride's face and champagne bottle was done from an assistant camera right utilizing an LED flashlight. Lights were placed under the table and below the drapes to frame the scene with lights. The special effects lighting was done by Frank Gloor of Otto Productions. If you are interested in adding some beautiful lighting and great sound to your wedding or other special event, I suggest you contact Frank. If you are interested in having your wedding or special event at a beautiful country club, call Brittney at the Club at Shadow Lakes.